Mary was born on 8 APR 1805 in Tennessee, the daughter of unknown parents. She died on 11 MAR 1867 in Benton County, Arkansas. 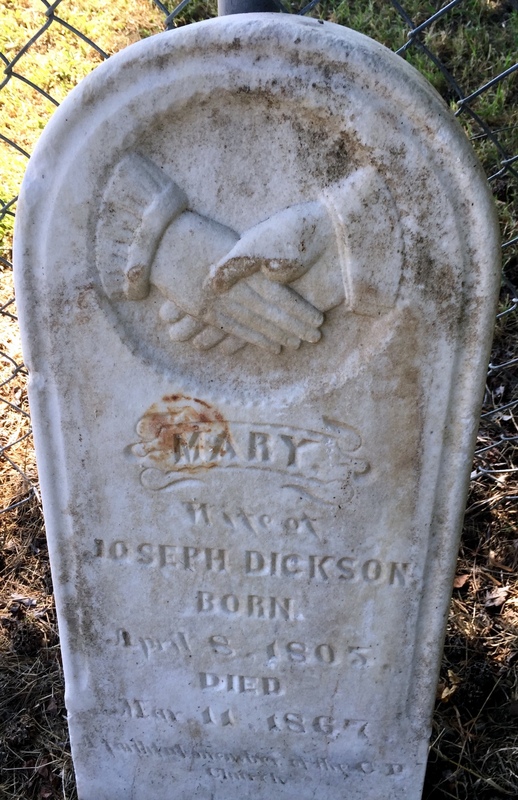 Her husband was Joseph Samuel Dickson, who she married on 30 MAY 1821 in Bedford County, Tennessee. Their eleven known children were Frances Ann (1822-1844), Margaret (1823-1824), Martha (1825-1861), Sarah Priscilla (1828-1828), Mary Jane (1829-1846), Robert B (1832-1863), Nancy Isa (1834-1916), John E (1837-1905), Joseph S. (1839-1909), Ephraim Harvey (1843-1921) and William George (1845-1862).